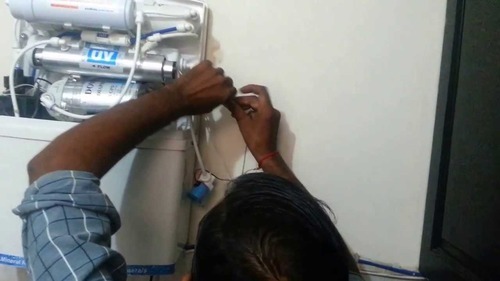 From the day we have entered in this business industry, we have been engrossed in offering Water Purifier Repairing Services. Rendered under the assistance of trained executives, these offered services are broadly acknowledged and recommended owing to their timeliness and effectiveness. More to this, our customers can get these from us at affordable costs amid the assured span of time. Incepted in the year 2013, Holy Water Solutions is a reckoned business name readily engrossed in the realm of presenting to our customers a wide array of manufacturing, trading, supplying and service providing of DRINKING WATER PURIFIER RO, UV,UF BOTH DOMESTIC AND INDUSTRIAL APPLICATIONS, Water Softener, Water Purifier System, AMC Services, Water Plants, Water Purifier Spare Parts, Water Purifier Repairing Services, Rainwater Harvesting Service. The products we offer are made under the command of dexterous personnel making use of finest class basic amenities and modernized tools and machinery. In conformism with the advancements taking place in this industry arena. Our products are made with utmost perfection. To add, the services we deliver are broadly acknowledged and recommended owing to their timely completion, reliability and exactness. Also, our inexpensive costs and delivery on time has made us a popular market choice.